Prompt service. Thorough, frank and personable. Thank you, Hunter and/or Vicki, for taking your time to write a review of our service. We’re pleased that you are pleased with our service. And very much appreciate your business! Appreciate the excellent customer service and the professionalism of the company. Definitely will recommend. Thank you, Mandi, for taking your time and writing a review of our company. We're thrilled to hear that you are pleased with our level of service. Thank you for choosing Pied Piper and allowing us the privilege to service your pest control needs. We appreciate your business! Thank you, Barry, for taking your time and writing a review of our company. We're super glad that you are well satisfied with or services. We appreciate your business! Thank you, Jennie, for taking your time and writing a review of our company. We're glad that you were satisfied with our level of service. We appreciate your business! Thank you, Ronny, for taking your time and writing a review of our company. We're glad to hear that you were satisfied with our service. We appreciate your business! Thanks, Kent, for taking your time and writing a review of our company. We're very glad to hear that you are pleased with our service. Thanks for choosing Pied Piper to take care of your pest/termite control needs. We appreciate your business! Good work! Very happy with service and performance. Thanks, Jim, for taking your time and writing a review of our company. Very glad to hear that you're pleased with our service. 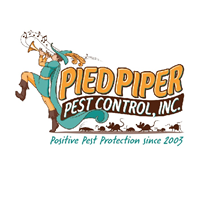 Thanks for allowing Pied Piper to service your pest/termite control needs. We truly appreciate your business! Great service, very friendly and knowledgeable people. Thanks, Kelly, for taking your time to write a review of our company. Super glad to hear that you are pleased with our service. Thank you for choosing Pied Piper for your pest/termite control needs. We truly appreciate your business! Thanks, Gail, for taking your time and writing a review of our company. So glad to hear that you are very satisfied with our service. Thank you for choosing Pied Piper - we appreciate your business! You all are terrific. We're very happy. Thanks, Chris, for taking your time and writing a review of our company - and such a nice review at that. We're super happy that you are pleased with our service, and we appreciate your business! Thanks, Victoria and Johnny, for taking your time and writing a review of our company. We're glad to hear that you are satisfied with our service. Thank you for your business! Thanks, Mrs. Nichols, for taking your time and writing a review of our company. We appreciate your business! Thanks, Roy, for your review and your business, both are much appreciated! I’ve had pest control service for the last year and couldn’t be more satisfied. I will be renewing my contract. Wendy, we are so glad to hear that! Thank you for giving us this opportunity to service your pest control needs, we truly appreciate your business... and thanks to for writing such a nice review, we appreciate the time you took to do so. So happy I read the reviews and Pied Piper delivered! Would recommend to anyone. Thank you, Yvonne, for taking your time and writing a review of our company. So glad to hear that we delivered! Thanks for giving us the opportunity to do so...we appreciate your business! Great service and very friendly staff to help you. Thank you, Rodney, for taking your time and writing a nice review of our company. We're glad you were satisfied with our service, and very much appreciate your business! Tech was very thorough and knowledgeable. Walked me through every step and explained on the way. Will recommend to anyone that needs pest control. Thanks, Jesse, for taking your time and writing such a nice review. We’re glad to hear that you were pleased with our level of service, and we very much appreciate the opportunity to service your pest /termite Control needs...thanks for your business! Caleb is friendly, courteous and most important professional. He explains how the system works and has followed through with any signs of infestation. The office is also extremely efficient. I'm very glad I found Pied Piper and am secure that I have someone who will respond quickly and professionally if I have any concerns about termites. Thank you, Ed, for taking your time and writing such a nice review. We appreciate you giving Pied Piper the opportunity to service your Pest/Termite control needs...we appreciate your business! Excellent service. Kaleb is the best. Thanks, Ramona, for taking your time and writing a review of our company. We appreciate Caleb too...he’s a great employee! Thank you too for choosing Pied Piper for your Pest/Termite Control needs...we appreciate your business! These guys are the BEST! They are always super friendly, on time and they do a great job! Thanks, Peter, for taking your time and writing such a nice review of our company. Glad to hear you’re happy with our service, and thank you for your business! Thanks, Christine, for taking your time and writing a review of our company. We love Caleb too! Such a great worker, and someone who truly knows the termite business. Thanks for choosing Pied Piper for your termite control needs! Thanks, Edwin, for taking your time to write a review of our company. Your business and review are much appreciated! Thanks, Bill, for taking your time to write a review. Your review and business are much appreciated! Very happy with service.Tech. was very professional. Thanks, Luke, for taking your time and writing a review of our company. Your business And review are much appreciated! Awesome people! Our service guy, Kevin, is such a nice and efficient person. Thanks, Nannette, for taking your time and writing a review of our company. We're glad that you are satisfied with our service, and thank you for being such a loyal customer... we appreciate your business! As long as I see no termites/termite damage, I'm happy. Thanks, Jay, for taking your time and writing a review of our company. And thank you for choosing Pied Piper for your termite control needs. We truly appreciate your business! Thanks, Anne, for taking your time and writing a review of our company, and am glad to hear that our staff is meeting your pest/termite control needs. Thanks for giving us the opportunity to serve you! Yes, I was pleased with your services. Thank you, Anthony, for taking your time and writing a review of our company. We're glad you were pleased with our service. Thank you for giving us the opportunity to service your pest and/or termite control needs! Thank you, Yvette, for taking your time and writing a review of our company, and thank you for choosing Pied Piper for your pest/termite control needs. We truly appreciate your business! Thank you, Marc, for taking your time and writing a review of our company. We are glad to hear that you are well satisfied with our service. Thank you for choosing Pied Piper. We truly appreciate your business! My favorite thing about Pied Piper is my personal connection with my guy. These folks do things the way they were meant to be done and Jacques takes care of business b. Thanks, Tyler, for taking your time and writing a review of our company. We're glad to hear that we are doing things right...always good to hear the good things. :) Thanks for choosing Pied Piper. We appreciate your business! Thanks, Jason, for taking your time to write a review of our company. Glad to hear all is well. Thanks for being a loyal customer of Pied Piper. We appreciate your business! Thanks, Joseph, for taking your time and writing a review of our company. We're glad you approved of our service, and want to thank you for choosing Pied Piper for your pest/termite control needs. We appreciate your business! Representatives were prompt and polite. Thanks, Charles, for taking your time and writing a review of our company. We are glad to hear that you were pleased with our service, and appreciate you giving us the opportunity to service your pest/termite control needs! Thanks, Melinda, for your glowing review. We feel the love. :) We appreciate your continued trust in our service, and appreciate your business... thank you! Thanks, Brooks, for taking your time and writing a review of our company. Glad to hear that you guys love your tech, and very much appreciate you giving us the opportunity to service your pest/termite control needs! Service technician arrived timely. Caleb the technician was very knowledgeable and explained everything in detail. Office personnel were pleasant and very easy to deal with. Gave great customer service all the way around when that is hard to find these days. Thank you, Susan, for taking your time and writing such a nice review of our company. It’s always nice to hear such a positive response. Thank you for choosing Pied Pied for your Pest/Termite Control needs. We truly appreciate your business! Thanks, Sue, for sharing your thoughts and writing a review of our company. Always glad to hear that our service is meeting and or exceeding expectations. Thanks for giving us the opportunity to service your pest/termite control needs! great service, Jacque is wonderful and always accommodating. Thanks, Mary, for taking your time and writing a review of our company. We're glad to hear that you are pleased with our service. We agree, Jacque is wonderful. We feel blessed to have him on board with Pied Piper. Thank you for giving us the opportunity to service your pest control needs. We appreciate your business!